With 2.3 billion monthly active users, Facebook is quite obviously the place to see and be seen. If you own a business or are an entrepreneur or artist of some type, you truly NEED to have a Facebook business page. Authors, musicians, lawn-care specialists, comedians, essential oil and makeup reps and even television shows have a presence on Facebook. Being online anywhere means building a community: bringing people together who share common goals and interests – letting them talk to each other about your brand and things that relate to it that interest them. It is not about bringing people to you. It’s about bringing them together. Use your page to talk WITH your community – not AT them. Make people feel as though they are integral to your life, brand, artistry or company, they develop loyalty to you and a natural affinity to gravitate towards whatever it may be you are selling. They will tell others about you, thereby making your community grown organically. Read your comments and reply. Show that you are interested in what they are saying, answer questions people have and just generally become a part of your own community, instead of just the leader. Let’s dive in and start creating your page! Before beginning, I recommend you have already at least come up with your company/stage name, a short punchy description of what you are doing and a logo or photo to use in your header image. (Make sure that your header image somehow relates to you and your product or service). The only one of these that are absolutely necessary to begin is the name, though. Other items can be added later – including your profile photo. One last piece of advice on this subject: if you are an artist of any type, a coach (life coach, etc), a marketing professional or any other type of personality, you truly MUST use a photo of YOU as your profile photo. People want to know who they are connecting with, after all! A business, church and nonprofit can use an image such as their physical building, one of their products and so on. 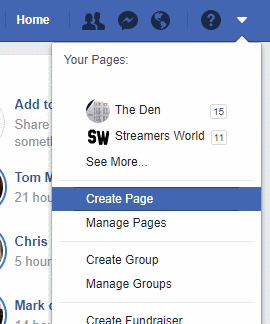 Login to Facebook and select the downward-pointing arrow then choose “Create Page”. Business or Brand – No matter what size your business is or how many people you employ (or even if it’s just you), if you sell any type of goods, this is the page you will need to build. Community or Public Figure – If your page will be created for a church group, club, musician, actor, someone who is a public speaker or author or any type of sports team, then choose this option. Basically, if you are NOT selling products, you will likely need to create this type of space. Once you have chosen the proper type, select the “Get Started” button in the respective box. First, type the name for your Page, then a category. For instance, you could type “blog”, “church”, “youth organization” or “musician”. Type just one word that best describes what you do and a list of suggestions will populate for you to choose from. After filling in these two boxes, select the “Continue” button. The next step is to upload a profile photo. This is not a necessary step to get started, but I recommend doing it as soon as possible. If you are marketing yourself, you will want to use a photo of yourself. If you are representing some type of organization, choose a picture that best showcases what it is you’re about. 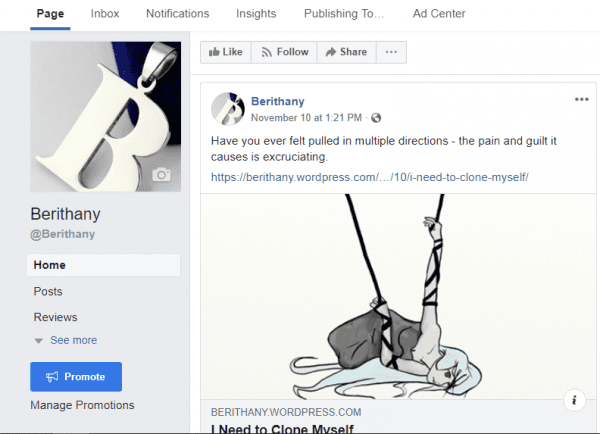 If you already have an actual website, always try to tie in your profile and cover photos on Facebook to match whatever you have on your site. If you choose not to add a profile picture just yet, skip this step. You are also able to upload your cover photo at this time (if you choose – you can go back and do it later before or after actually publishing the page). Facebook cover photos ideally should be around 851 pixels wide and 315 pixels tall for desktop or 640 pixels wide by 360 pixels tall for mobile. If the photo you choose is too small, Facebook will stretch it to fit the space… meaning it may end up distorted. There are several excellent free websites out there that can help you create your own cover photo, such as Canva. I use this site to create pretty much every type of graphic I use online. It’s so easy and intuitive and produces high-quality images for me to use! You will now be taken to the very first iteration of your page. On the left under your profile photo, there is a small box that asks you to give your page an @ name. This will become the permanent name of your page, so choose wisely! If you are ready to give your page its forever name, go ahead and select it. Right in the middle under your cover photo, you will see a box to add a description. Select this box and describe your new page. This is not where you add your lengthy full description. Add a punchy or fun sentence or two up to 155 characters telling the world what they will find when they visit you and who you are. Once you have saved your short description, a new box will pop up asking if you want to add more information to help others find and follow you. If you would like to do this now, select the “Edit Details” button. Once your Facebook page has been created, you will begin seeing boxes called “Page Education” when you log in. Each week there will be new suggestions. These are helpful to you and you definitely want to check out the tips given here. They’re very easy to understand, even for those of you who are not as Facebook savvy as others may be. 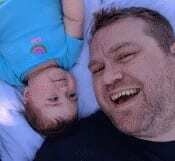 There are several pieces of information you can add here. Once you have gotten to the ”Edit Your Details” screen, you will see a few options along the top. Now that we have adjusted this information, you’ll be taken back to the main page. Just above where you would make your first post, you will still see the “Welcome to Your New Page!” box. Select “See All Page Tips.” to help walk you through even more page setup options. You will be shown how to create, add and rearrange the page buttons (such as the Like, Follow, Share and more options) and invite friends to come and “Like” your new page. This is the fastest way to start building your community. Get your friends and family on board! At the top right of your page, select the “Settings” option. Here you are going to see a plethora of additional things you can tweak to make the adaptation of your page suit your particular needs. When you open this page, you will see a LONG list of options in this first “General” category that you can edit and tailor to your specific needs, such as messaging settings, restrictions and even a profanity filter you can toggle on. I am not going to go through every one of these, because most of them are self-explanatory. Go through each one and make your choices by clicking the “Edit” button to the right of each line. On the left side of the page you are on, you will see various other categories. Check out the “Templates” section. Choose the proper “theme” based on the type of page you are creating: business, nonprofit, venue, politician, restaurants and so forth. The “Page Roles” section allows you to add page Admins, Editors or Moderators. Choose wisely when adding someone to help handle your page. You do not want to end up with someone who could inadvertently cause you harm. 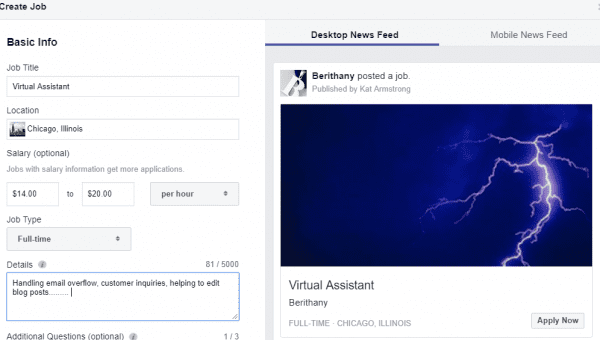 If you want someone to be able to post on behalf of your page and answer comments – but not be able to make any changes to the page itself – then place them in the “Editor” role. When you select each of the various roles, a small description of what they can do will display beneath the box. Take the time to go through each of the various settings in this area, tweaking them as needed. At the top of your page, select the “Publishing Tools” option. This gives you quite a bit of practical tools and insights. When first opened, you will see a list of the posts you have already published (if any). You’ll be able to tell with a quick glance what your post reach is for each one: this is how many people were reached and/or have seen what you wrote. It also shows how many clicks (if you placed a link in the post) and actions (likes, shares and comments) the note you shared has received. One of the coolest things on this screen is the ability to create “Job Applications”. If you job openings for your business, select this option. At the top right of the screen, select the “New Job Post” button. A box will pop up allowing you to construct the listing for your employment opening. On the left, fill in the job title, the location of the position (even if it is a remote career), the salary range (this is optional,) the type (Full Time, Part Time, etc) and a short description of what you are looking for. You can even use this form to weed out unqualified applicants by selecting “Additional Questions”. You can now create a couple of questions that people will need to give 1-2 sentence answers to when applying for or inquiring about your opening. You should think about doing this as it makes it easier to wade through the multitude of applications you will be getting. As you fill in the information on the left, it will appear in the mock ad on the right, allowing you to see changes until you are satisfied with how it looks. You can toggle between the desktop and mobile versions prior to posting the app so that you can be sure it looks right on both. Select the “Insights” button at the top of your page. Here you will find a substantial amount of data to help you see how your page is faring in the Facebook world. You can check to find out how many visitors you are receiving in a selected time period, how many likes, comments and shares you have collected and the “reach” of your page and posts (which means how many people have been exposed to your content.) There is even an area for seeing how videos are performing, one showing the recommendations your community have left for others to read and demographic information about your followers. Choosing certain ones may require you to add links to your shopping page, your phone number and other contact information and so forth. This gives your community easy ways to get to your merchandise or contact you with questions and feedback. ALWAYS be sure to respond as quickly as you can, even if it is just a simple “thank you.” This will go a long way toward building a solid foundation of trust and communication, which in turn builds a strong community who sticks around for the long haul. For better or worse, your Facebook business page has now been created and your journey online has begun. I recommend getting that first post made as quickly as possible, whether it is an introductory post or a link to a blog post. Get yourself out there by inviting friends and family to “Like” your page and ask them to spread the word. If you are using Twitter, Pinterest or Instagram along with your Facebook page, be sure to share the link to your page and first post on these other social media platforms so others will come see what you’re up to! This wraps up my “simple” page creations tutorial for Facebook. As always, please leave me a comment or use my link above to shoot me any questions you may have. It is now time for you to fly. Go ahead and make your first post! How do i turn off “page education”?